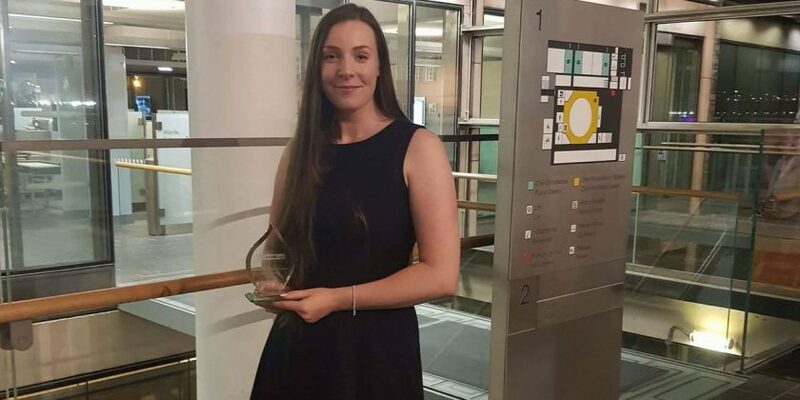 A Wrexham Glyndwr University graduate received one of the social care industry’s most prestigious awards. Sian McGraa was presented with the Spirit of Social Work Award at the British Association of Social Workers (BASW) prize-giving in Cardiff. The 28 year-old, from Buckley, completed a BA (Hons) Social Work at the institution before taking up a role with Denbighshire County Council’s Community Support Services team. Nominated by boyfriend Keith for her kindness and dedication, Sian decided on a career in the sector after spending many years caring for her dad when he developed Pick’s Disease, a form of dementia. Those nurturing qualities led her to join the supported living service at Flintshire County Council, before taking the plunge and joining the University in 2013. “Not only did the degree give me the confidence to go on and become a social worker, it gave me the opportunity to see how the care sector works through a series of placements with Denbighshire,” said Sian, based in Ruthin. Sian visited the Senedd to pick up her award, which was given to her following positive feedback and glowing praise from many of the people she helped in the role, as well as their families and friends. She now looks forward to a long career in the sector, having never dreamed she would take the path of a social worker. “I think the time spent caring for dad played a part, as I came into contact with carers and social workers and saw the amazing work they do,” said Sian. “That’s what led me to the course, which was brilliant and really interesting. “You can never be fully prepared for practice until you’re in it, but the placements give you real-time experience of different scenarios, and learning from lecturers who have spent time in the sector also gave you an insight into how to deal with things. She added: “To then go on and win such a big award was a real thrill, a total surprise. Dr Caroline Hughes, Associate Head of the School of Social and Life Sciences, congratulated Sian on the accolade.